Restored statue with damaged areas inpainted and sealed with lacquer. 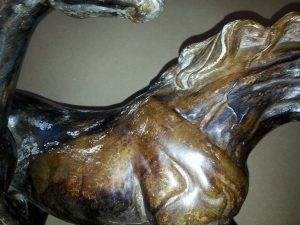 Faux bronze statue after attempted polishing damaged finish. This small statue of a group of horses appears to be made of cast bronze. When the owner attempted to polish the “bronze” with metal polish, the caustic chemicals ate through the faux bronze finish to the plaster beneath. Using artist’s colors, restorerer John Allen blended the damaged areas to match the original finish. The piece was then sealed with several coats of satin lacquer applied with an air brush. 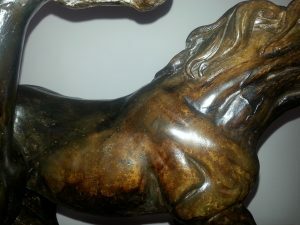 The final step was a light rub out with polishing compound to produce a perfectly smooth surface with an even sheen replicating the appearance of bronze.